"Workshop" - a type of independent work performed by students without direct contact with the teacher through special teaching materials; inalienable compulsory link of the learning process, providing primarily individual work of students for the implementation of RO in the PEP of the MMF for the 2018-2019 academic year. December 25, 2018, on the subject of obstetrics-gynecology by the assistants-teachers V. D. Tursunova and J. A. Abdirasulova organized the contest “The best workshop” among 4th course II students. 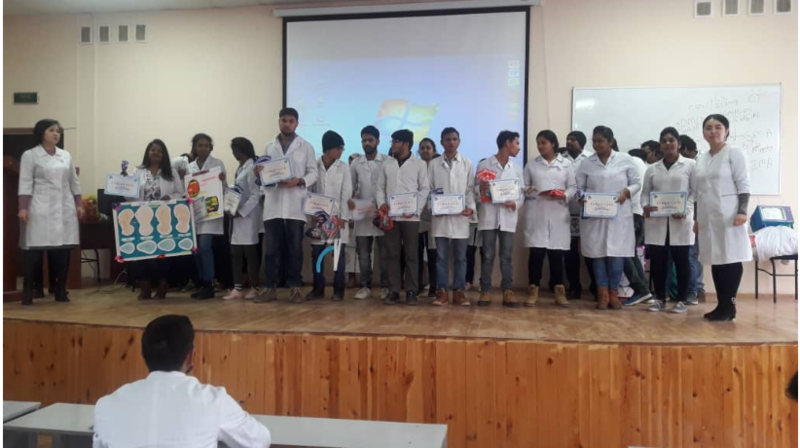 The competition was attended by all the students who created and built their creative handmade creations associated with the thematic CPF plan for obstetrics. The chairmen of the department, candidate of medical sciences, associate professor M.M. Bugubaeva, PhD Said Ali Abbas, teacher A.E. Omurzakov, who assessed the work of students according to the following criteria: quality of work and content of informational, calculated, visual material, personal interest of the author, creative approach to work and its design, quality of work presentation, approximate time spent on their implementation. The presentation of each workshop was accompanied by an explanation of this work by one or a group of students. Workshop provided great motivation to both the participants and those present. As a result of the competition, three “the best workshops” were chosen, which were presented with gift certificates.The remaining participants were satisfied with the desire to modify their “workshop” at competitions in other subjects or next year. In addition, the organizers of the department pleased each participant with chocolate.